Unlike Bugs Bunny, we found our way from Elephant Butte to Albuquerque just fine! The state’s largest city, named in honor of a town of the same name in Spain, has beauty in and around it — with the grand Sandia Mountains to the east and the Rio Grande River running through it. It also has a growing film and television presence thanks to generous incentives provided by the state. 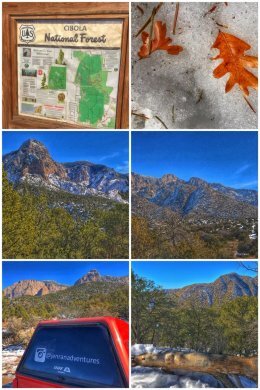 We started our adventures here with a snowy/icy/muddy hike in the Sandia Mountains — in the 1.6 million-acre Cibola National Forest. (The name Cibola is thought to be the original Zuni Indian name for their pueblos, but later interpreted by the Spanish to mean buffalo.) 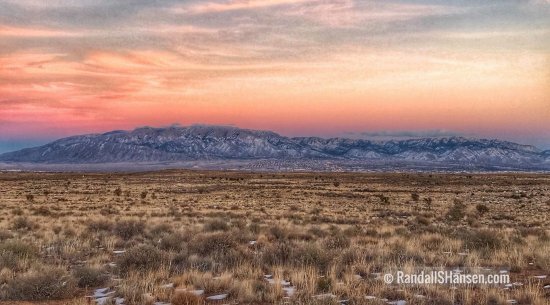 The Sandia Mountains are a small range (about 17 miles north-to-south) that are part of the Basin and Range Province. The range contains two major summits: Sandia Crest — the highest at 10,678 feet — and South Sandia Peak — at 9,702 feet. Sandia is spanish for watermelon — perhaps named for the reddish color the range gets at sunset, as seen in the top photo. 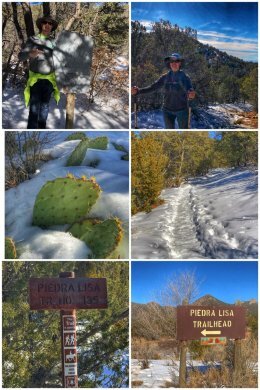 We decided to hike the Piedra Lisa Trail — from the south trailhead north. 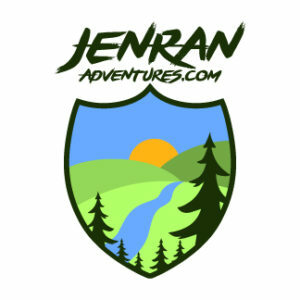 This trail is a wonderful hike that includes some time in the 38,000-acre Sandia Wilderness… and one can hike from the south trailhead all the way to the north trailhead — about 6 miles one way. Hiking from the south trailhead (off Tramway Blvd.) was a fun experience, starting quite easily before leading to steeper hills up to the ridge lines… but the views! To the east of the ridge is Upper Juan Tabo Canyon, and to the west is the broad Lower Juan Tabo Canyon. With the snow and mud (yes, we encountered both depending on what side of the mountain we were hiking) slowing us down, we ended up hiking about 3 miles, but it was indeed beautiful. The Sandia Mountains are also home to the Sandia Peak Ski Area — on the east side of the mountains. One can take the Sandia Peak Tramway from the westside up to the ski area. We missed out on the tram on this visit, partly because of the weather, but many people recommend the ride for the amazing views. As is often the case with us, to reward ourselves for a fun and challenging hike in nature, we decided to stop at a local winery for a little wine-tasting after we got down from the mountain. VARA was an unexpected pleasure, offering an international family of Spanish and American wines –celebrating the origins of the American wine experience tied to the historical connection of Spain and New Mexico. The winery (and soon spirits) offers a fine tasting flight of sparkling wines, as well as reds and whites — all produced either in Spain or California’s Central Coast, but all of Spanish heritage. 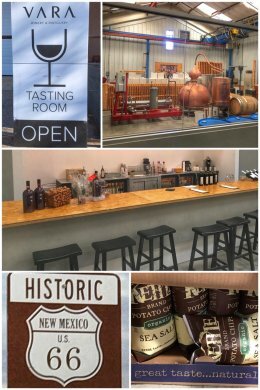 Eventually, the wines will be made in New Mexico and include grapes grown in southern New Mexico. We had a wonderful server who shared great information about the Spanish varietals and then left us alone to taste and contemplate. We left with a delightful bottle of Tinto Especial ~ Tempranillo Lot #013. Two other notes from the photo collage. First, we should mention we stayed at an RV park just off of Historic Route 66 — which went through Albuquerque between endpoints in Chicago and Santa Monica. As we travel, we love crossing paths with Route 66. Second, we will go out of our way for organic products — even ordering a case of our favorite Organic Kettle Sea Salt Potato Chips, delivered right to our campground! 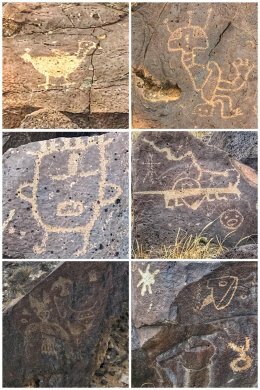 Next up for us was another hike — with a goal to see more ancient petroglyphs (rock carvings). 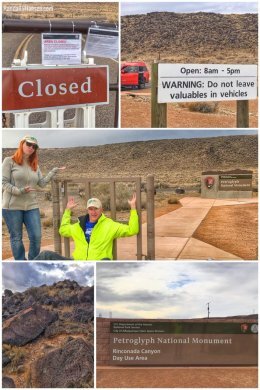 While the Federal Government shutdown sadly continues, the trails in the national monument remained open to the public — though the main entrance and visitor center were closed. The national monument, established in 1990, is jointly managed by the National Park Service and the City of Albuquerque, and encompases 7,236 acres along the West Mesa of Albuquerque — a crazy, beautiful volcanic basalt escarpment that includes four major areas: Volcanoes Day Area, Rinconada Canyon, Boca Negra Canyon, and the Visitor Center. It was near the Volcanoes area where Ran shot the top photo of the Sandia Mountains. 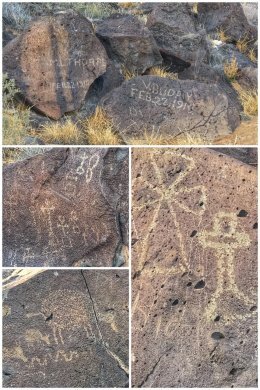 The monument protects one of the largest petroglyph sites in North America, featuring designs and symbols carved onto volcanic rocks by early Native Americans (estimated about 400 to 700 years ago, or longer), as well as Spanish settlers/sheep herders (from 400 years ago). Experts estimate the Albuquerque volcanoes last erupted 200,000 years ago. For whatever reason, the Rinconada Canyon Trail called out to us. This fairly easy 2.2-mile loop trail first follows the volcanic wall deep into the canyon. 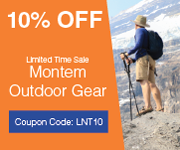 Along the way, hikers can expect to see some 300 petroglyphs carved into the basalt rock faces. The trail is mostly sandy — but do not let that fool you… you are walking on the Santa Fe Formation, which is believed to be up to 25,000 feet thick in some areas. This formation is comprised of alluvial sediments (sand and gravel) that eroded from nearby mountain ranges and were washed down into the valley by ancient streams. Archeologists believe ancestral Puebloans made most of the thousands of petroglyphs in Rinconada Canyon 400 to 700 hundred years ago. (Some images may be closer to 2,000 to 3,000 years old). And while experts continue to debate their meaning, one can find symbols of animals, people, insects, and geometric designs in what is now called the Rio Grande style. Experts also believe that some Native Americans view volcanic landscapes as sacred places. Besides the native petroglyphs, one encounters crosses, sheep, and branding marks left by Spanish shepards, who used the three canyons walls as a natural barrier in herding. Much of the land here was part of the Atrisco or Alameda Land Grants from the Spanish. The Boca Negra Canyon section, located in the northeast section of the national monument, offers several short, but steep (moderate to hard) trails — Mesa Point, Macaw, and Cliff Base — offering those who venture on these trails fairly up close views of about 100 petroglyphs. The Volcanoes Day Use area, located on the west side of the national monument, offers multiple trail options, ranging from 1 to 4 miles — and allowing one to walk near and around up to three (of the five cinder cone) dormant volcanoes. No petroglyphs have been found in this section, but the area offers some amazing panoramic view of Albuquerque and the Sandia Mountains. 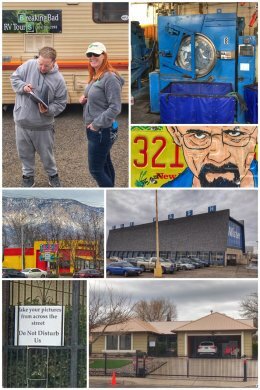 We ended our visit with a crazy and fun adventure having nothing to do with nature, but everything to do with our love of a ground-breaking and critically-acclaimed television series: Breaking Bad. The AMC series, created and produced by Vince Gilligan, and starring Bryan Cranston and Aaron Paul, was on the air for five seasons, running from 2008 to 2013… and, you guessed it, filmed in Albuquerque. Breaking Bad is ingeniously good — because it takes an average man on the verge of life and death, Walter White (Cranston), a meek high school chemistry teacher who transforms into a ruthless major drug dealer who will do what it takes to protect his legacy — and the financial future of his family. He teams up with a former student who is a minor drug dealer, Jesse Pinkman (Paul), to produce and sell large quantities of crystal meth. The series took a few seasons to catch fire, but by the time it ended, it was the most-watched cable series. Over the years, Breaking Bad won numerous awards, including 16 Emmy Awards, 2 Golden Globes, 4 Television Critics Association Awards, and countless others. Jen was an early adopter to the series, while Ran was introduced to it later, but both of us agree with all the positive critical acclaim… and so, when in Albuquerque, one has to do pay homage to the series — and the various locations around town where it filmed. 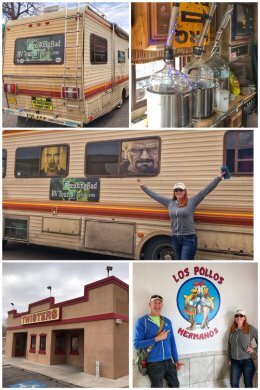 We chose to go with Breaking Bad RV Tours, which uses people who worked on Breaking Bad as tour guides, and which escorts participants to 17 film locations (including some from Better Call Saul) on a beat up older RV similar to the one Walt and Jesse use to first cook meth in the series — and filled with all sorts of memorabilia from the series. We also were entertained between locations spots with video clips from the show and a few parodies of the show. We thoroughly enjoyed the 3-hour tour around Albuquerque. We also lucked out on our tour, as Rodney Rush, who played Christian “Combo” Ortega met us at the “A1A Car Wash” to shake hands and sign autographs… and he even did a bit of beatboxing for us! New Mexico, along with a few other states outside of California, have attracted major television and film productions to the state by offering major financial incentives. Besides Breaking Bad and Better Call Saul, other productions include: The Avengers, Whiskey Tango Foxtrot, Sicario, Preacher, Longmire, Get Shorty, Crash, and Dogs of War. We next head to the Santa Fe area — and our furthest point north in the state. Previous Post:Stop 67: Truth or Consequences?